Looking to intern in the film industry? This sample resume shows how to pitch your skills and classroom training in a way that will get you noticed. Looking to get into the film industry? An internship is a great way to start. In fact, the National Association of Colleges and Employers Job Outlook 2018 survey found that employers prefer to hire candidates who have completed internships or cooperative education assignments. 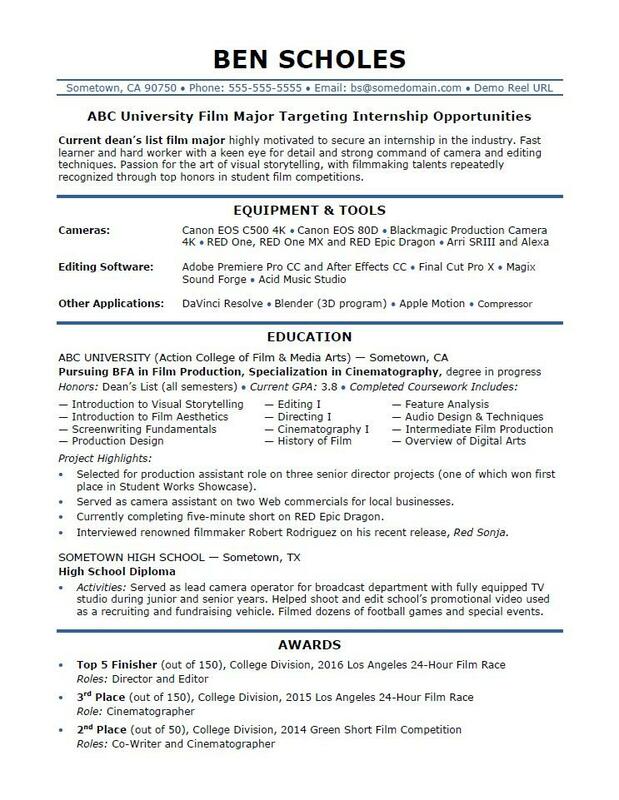 For inspiration, view our internship resume sample below to see how to pitch your skills and classroom training, and download the film industry internship resume template in Word. And if you need more help, let the experts at Monster's Resume Writing Service create a high-impact resume for you that will impress employers. Additionally, you can learn about media careers and search for internships on Monster. Current dean’s list film major highly motivated to secure an internship in the industry. Fast learner and hard worker with a keen eye for detail and strong command of camera and editing techniques. Passion for the art of visual storytelling, with filmmaking talents repeatedly recognized through top honors in student film competitions. Selected for production assistant role on three senior director projects (one of which won first place in Student Works Showcase). Served as camera assistant on two Web commercials for local businesses. Currently completing five-minute short on RED Epic Dragon. Interviewed renowned filmmaker Robert Rodriguez on his recent release, Red Sonja. Activities: Served as lead camera operator for broadcast department with fully equipped TV studio during junior and senior years. Helped shoot and edit school’s promotional video used as a recruiting and fundraising vehicle. Filmed dozens of football games and special events.